No specific faults or amendments to the alleged inaccuracies are suggested. The reader comments, overwhelmingly in support, remain posted. A letter penned by four israelis (surprise, surprise!) that objects to the article was published on February 18. Our friend Dr Swee responds to this development and elaborates on the figures. Many of us are afraid to put numbers down because the pro-Israel Lobby will inundate us with emails and complaints. This has gone to the extent that only figures sanctioned by the Israelis are credible. Everything else is viewed as suspect! Over the last twenty-six and a half years, I have taken many blows over this kind of issue. The only question I ask myself when writing is – when is the version according to the victims going to be articulated? The people of Gaza knew that 5,000 were killed in the Khan Younis massacre in 1956; 100,000 gone missing in 1967 of which 35,000 were murdered – just because they cannot go to the Sinai and take pictures, or dig up the mass graves, does not mean we refuse to let them state their case. I looked at Northern Gaza – how often have I driven down Sala -Uddin Road in 1988 and 1989. I remember every turn and corner- I know the citrus orchards, the farms and the homes. Often I would stop my ambulance to give a ride to the farm workers and they in return would give me freshly picked lemons and oranges. I now see it completely laid waste by Israeli explosives like the nuclear holocaust of Hiroshima, and yet we were called liars when we put forward the figure of one and a half million tons of explosives. We have seen apartment blocks not only reduced to rubble but incinerated – how many kilotons of explosives are responsible for this kind of damage? The Lancet Global Health Network withdrawing `The Wounds of Gaza’ is not a problem at all. The wonder is how it even got to be published in the first instance. My book From Beirut to Jerusalem, when first published in 1989, was reprinted hard back and then paperback within 2 months, as it was sold out on publication, and again sold out as soon as reprinted. Then Tom Friedman came out with a book with exactly the same title half a year later and by the same publisher. My book was withdrawn from the shelves. It went out of print for many years. But the truth has to come out. Most times at great inconvenience to some of us as we well know. I just want you to know that I am not afraid to believe the Palestinians. It is a scandal that the extent of the Khan Younis massacre had not come to light for all these years. It is a scandal that what happened in the Six Day War was not published. The intimidation to silence witnesses has to stop. We cannot allow the case to be stated only by the perpetrators of the killings. Like the Palestinians in Gaza – I am also not afraid. My witness of Gaza counts. So does your witness. We should not be afraid of saying what the Palestinians told us. They are the ones whose families were killed, who bear the wounds of violence, who are dispossessed and persecuted. Their voices must be heard. The actual tonnage of the explosives dropped on Gaza can only be accurately known to the IDF themselves. So other figures can only be estimates. However some of us have many years of experience looking at bombed out countries. Over the 22 days, Gaza was intensely bombed from land, air and sea. The bombs dropped from the air are large, and most of them are more than a ton on average. In the south the bombs used to destroy the tunnels and structures around them are large heavy bombs. Of the 21,000 buildings destroyed, 4000 of them are completely demolished. Some believe that these are by small nuclear fission bombs. However there is no proof and it is impossible to tell, though the effect of all structures, especially concrete, being incinerated, would suggest that the size of these bombs are of the order of kilotons­whether they are conventional explosives or otherwise. If you were to look at the effect of the atom bomb on Hiroshima (about 15 – 20 kilotons), you would see the incineration of concrete similar to that of that seen in these 4,000 buildings. These 4,000 buildings would have been destroyed by 4,000 kilotons of explosives. The other 17,000 destroyed buildings are the result of bombs of single figure tonnage judging from the kind of destruction. Apart from bombs being dropped on buildings reducing them to rubble, bombs were also dropped on fields, orchards, farms and roads. We do not know enough of the explosive values of DIME to comment and hence have not speculated on it. They have been used in Gaza. But from what is commonly known about them, they are very heavy bombs, more so than conventional. As to the person who queried the “million and a half tons of explosives dropped in 22 days” as such an amount would have obliterated Gaza [a question put forward to http://www.womenforpalestine.org, a site which carried Dr Ang’s article]­ we can safely answer him that the whole of Northern Gaza has indeed been obliterated – he or she is most welcome to see for themselves! The whole stretch of Northern Gaza has been converted to a complete wasteland. In the South again vast stretches of agricultural areas have also been demolished. The figure of one and a half million tons of explosives in our view is a conservative estimate. Those who are sceptical about it need to see it for themselves. The number 35,000 was from the International Co-operation Department (ICD) of Gaza. Within the first 2 hours of the attack on Egypt, 11,000 Egyptian soldiers were killed. But we are not talking about them, as they would be those killed in action. After the first 2 hours till the end of the 6-Day War, about 100,000 Egyptian and Palestinian combatants were missing and never found. These included many young men in Gaza who had joined the Egyptians and the early PLA (of Nasser) to fight the Israelis. There are at least 2 mass graves in El-Arish on the edge of the Sinai desert, and the Israelis themselves had admitted to killing those captured, but had not admitted to killing so many. The Gaza information had stated 35,000 executed, but we had not asked them the whereabouts of the remaining 65,000. Many of the missing still have surviving relatives living in Gaza. The names of those executed could be traced from the ICD in Gaza. 1967 is a long time ago, and I do not see what advantage it is to the ICD in Gaza to make up these figures. As many of you will be aware, a similar situation occurred with the Sabra and Shatilla massacre, where Palestinian sources believed that 3,000 were killed and IDF only admitted to over 300. Bayan Al-Hout had compiled at least one and a half thousand names to date, and the list is still increasing. We still do not know the whereabouts of the men murdered in the Stadium, now that some soldiers of the Phalange have admitted to executing people there. The bodies buried in Martyr’s Square were from within the camp itself, and not those abducted to the Stadium. Since its first days, Palestine Think Tank has been supported by a wonderful site and by the truly dedicated activists there. Alter Info has been under a lot of pressure from the usual Israeli Lobby organisations, this time in France. We wish to express our support of Alter Info, to hope that they are able to win this case, and that some benefactors are able to help them with the growing legal costs. Please read their press communiqué and, if you are able to, show your support of those who provide information so that the lies and propaganda will not win, and that peace and justice will prevail. Since the beginning of our legal issues, many have supported us and showed their solidarity. Thanks to you, we managed to face adversity with dignity and honour. Therefore it is natural that I keep you informed of the legal outcomes and political games around this case in order that each of you realizes to what great extent not only this website but more generally freedom of speech and particularly individual freedoms are under attack. At the end of December 2007, we received a letter from Mr Lilti, attorney for the UEJF & J’Accuse organisations, formal notification asking for the removal of a translated article by Henry Makow entitled Capital Imperialism and published in September 2007. In this letter, Mr Lilti, among the usual clichés and predictable accusations of anti-Semitism, declared that even if we removed Ms Skandrani’s article, he would nevertheless file a case against me for “hate incitement.” What I find a little bit puzzling is that the Attorney General added a “crime against humanity” charge to the other insanities my detractors are accusing me of. After the first provisional order, a second one was canceled thanks to the perspicacity of the President of the High Court: I had sent a letter to the President of the Paris court and tried to show good faith by removing the offending article before a second provisional order could be issued. I told him about the nefarious plot of our detractors and the fallacious reasons brought up just to harm us financially and shut us up. For reasons unknown to me, the Attorney General of Mulhouse proceeded nonetheless to quote from the second provisional order in order to accuse me of “denial of crime against humanity.” Despite the lucid decision of the President of the Paris court, UEJF & J’accuse intend to use the second provisional order as a new tool of censorship and coercion. Having failed miserably in their provisional order attempt, they still managed to coerce the Mulhouse Attorney General to hear their complaint. The provisional order requires us to remove the article and pay damages to the two plaintiffs. It galls me to submit to this insidious blackmailing, especially as we had taken precautions before publishing the article. We included a preamble forewarning the reader of the article’s tendentious words. I naively thought that the Court of Appeals would analyze the substance rather than the form of the case – normal procedure during provisional orders – so we decided to appeal its decision. We were amazed that despite having proven the dishonesty of our detractors – who drew analogies and comparisons between our case and the Muhammad drawings case (for which precedents would have favoured our case), the Court of Appeals nevertheless sided with UEJF & J’accuse. So, according to our attorney, on May 17th 2008, the appeal judge confirmed the provisional order conclusions. In addition, he doubled the damages. Though we have not yet received legal notice of the appeal judgment, the attorneys and solicitors of the plaintiffs are rushing us to pay for their fees and the costs we are also liable to. However, not having received a legal notice of the appeal judgment, we can still lodge an appeal with the Supreme Court – for up to 30 days after receiving this document. Since December 2007, our detractors have induced financial costs exceeding more than 5 times the yearly operating budget of our association i.e. more than 20,000 euros. UEJF & J’Accuse, two so-called anti-racism organisations, are sub-agencies of CRIF (Representative Council of French Jewish Institutions). This self-proclaimed institution assumes the right to speak and act in the name of all French Israelites and Jews. At annual dinners, the leaders of this organization don’t hesitate to lecture our political and media elites, “suggesting” legislation, even humiliating some attendants. We don’t know which legal or moral right, which values allow this organization to hold such strong political influence and to hijack the voice of all French Israelites, given that less than 4% of this population are members of CRIF. The deeds of organisations whose methods are similar to those of CRIF sub-agencies UEJF & J’accuse are not democratic at all and are in fact contrary to any republican principle. Indeed, lobbying is a common and legal activity amongst Anglo-Saxon societies, and even if European Union institutions are trying to integrate lobbying into their governance model, the French Constitution does not allow lobbying. Their constitutionality notwithstanding, some lobbies have greater political influence than others and often they are the ones responsible for instigating social tension. The masks have fallen and that’s enough for now! You have absolutely no right to speak neither in our name nor in the name of our own who were penned in ghettos, murdered in pogroms, killed in death camps, but who were also part of all the struggles, from the International for a better world to the Resistance against the Nazi intruder, against colonialism and for freedom, justice, dignity and equality of rights. You cheered and supported the crimes of the IDF, crushing under its bombs the population you call “a hostile entity”, bringing down houses, devastating crops, targeting schools, mosques, hospitals, emergency cars and even a graveyard … Now you are on the side of the Apartheid supporters, oppressors and modern barbarians, and the blood of their victims is spilling on you. Meanwhile, you lost all human sentiment, all compassion in front of this distress, you’ve outraged and soiled us by assimilating all the Jews to the supporters of a bunch of war criminals in the same way you soiled the memory of Rachi, Edmond Fleg, Emmanuel Levinas and many others – all that French Judaism was carrying in terms of human worth, intelligence and light. You’ve tried to transform a colonial and geopolitical conflict into a communitarian conflict and by pretending that “95% of the French Jews support the Israeli invasion”, you stir up anti-Semitism while claiming to be concerned with its return, like pyromaniac firemen. No, Ladies and Gentlemen who are leading the so-called “representative” council of the French Jewish Institutions, in our eyes you represent nothing except the zelators of an abject slaughter. Following the Zionist entity’s attack against Lebanon in 2006 and more recently against the martyred people of Gaza, the CRIF can no longer hide its real nature. By the way, the UEJF, one of the associations who initiated legal proceedings against us, was leading the demonstrations supporting the IDF while it was committing atrocious crimes against children, women, poor and elderly – already exhausted from hunger and misery. For any political leader to explicitly and cynically support a foreign power by accepting CRIF directives that are detrimental to the interests of his nation is not only morally reprehensible, it’s high treason. Israel is more than a morally illegitimate state; it’s the fruit of an abject colonialism under the guise of an heroic and romantic epic, cleared by the myth of the wandering people, oppressed for more than 2,000 years. Oppressed yes, wandering no! In addition their oppressors have always been Europeans; never in the territory of Islam did Jews experience pogroms or mass crimes. On the contrary, each time Jewish communities were oppressed they always found shelter in the territory of Islam. However, Zionist propaganda takes effect insidiously and stirs up anti-Muslim racism. 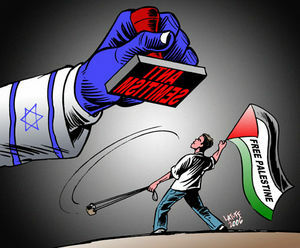 The CRIF has several masks; a public one that allows this organization to maintain the illusion of inclusiveness within inter-faith and inter-community dialogues; and a more hideous, insidious one serving dark schemes that seed hate and fear between communities and try to muzzle any criticism of Zionism and Israel. The story of the “wandering People” is just an historic myth serving an ideology, a biblical alteration, a mythology that justifies the application of so-called “divine right” that supersedes even international right. We can’t fix an injustice by creating a greater one. This is however the role these self-proclaimed organizations are limited to; monopolizing noble causes like the fight against racism, while diverting them from their original goal in order to benefit the Zionist ideology. These details about the CRIF are important since they help us understand the abject methods this multifaceted organization uses in serving one single goal: to defend Israeli policy at all cost. It uses front agencies like UEJF in order to maintain its status as an honorable organization. By the way, Marc Knobel, President of the J’Accuse organisation, and co-plaintiff, is one of its active members. One of my dearest friends and fellow Pro-Palestine Blogger, Steve Amsel wrote a post about a “tool” I mentioned to him and other friends. Please visit his site to join in the discussion. Below his post is the post by Sinéad of http://irish4palestine.blogspot.com/ , who remarks on another group of organised pro-Israel “net warriors”. Great comments there too. ZIO WEB ATTACKS ~~~ ARE YOU A ‘VICTIM’? Do you write articles giving the truth about the Israeli/Palestinian conflict? Do you have a Blog known for its anti zionist viewpoints? Have you been getting extra ‘visitors’ to your Blog who leave negative comments or participate in polls? If yes to any of the above, there is a good reason for all of this….it’s a project called Megaphone Israel.It is a new desktop tool that alerts its subscribers to any entries that might be anti Israel or anti zionist. After notification, the ‘warriors’ jump into action and attack the source of the article. Are we to quiver in our seats because of this? Are we to stop posting because of this? I THINK NOT! As long as Israel continues its existing genocidal policies and actions against the people of Palestine, Blogs such as this one will continue to expose their crimes. Where the media fails to, we will present the facts. So Megaphone Israel should be kept busy for the next (hopefully) short while. Do any of my readers have suggestions as to how we might also be alerted….. to racist or zionist postings on the Web? We too should be posting OUR comments on their sites, just to let them know we are aware of their ‘games’. Thanks to Mary Rizzo for the alert on this situation…..
What do BLOGGER, YOUTUBE, FACEBOOK, and WIKIPEDIA have in common? Following up on yesterday’s post “Is Israel Controlling the Internet” today we will learn about Israel’s Government and the IDF attempting to censor and control the internet, face book, you tube and many other social networks, blogs, message boards and news organisations. Today I will be discussing these groups who work online for Israel and the IDF (Israeli Army). These groups came about after the many genocidal murders committed by Israel and the IDF. Hundreds upon thousands of Lebanese, Palestinians being killed, with the majority of them being innocent civilians, women and children. Israel need helps to re-create its image worldwide. What better place than the internet? Why the internet? Because the internet is a huge echo chamber. It also influences what news you see on your television or MSM news sites, like CNN, ABC, MSNBC and CBS for instance. It also influences what you read in your newspapers worldwide. With today’s 24 hour news cycle, the need for fresh news is quite important for retaining viewers and readers. So, many news publications and organisations turn to the internet to see what the “buzz” is and then report on that. Also, due to the internets wide range of people and access to webcams, videos and blogs, many times regular individuals get important news online before main stream media does. Given these facts, who ever controls the internet controls the news and controls the battle for the hearts and minds of the general public. The USS Liberty off the coast of Egypt was attacked without warning. The attack lasted 40 minutes and 34 Americans were murdered, with 17o injured and the Ship destroyed. theories as to why Israel would take such drastic action against its superpower ally is that the Liberty, a $40m state-of-the-art surveillance ship, was eavesdropping on an Israeli massacre of Egyptian prisoners of war. The assertion of a cover-up was lent weight by a 2003 independent commission of inquiry which reported that the attack on the Liberty “remains the only serious naval incident that has never been thoroughly investigated by Congress”. GIYUS.ORG spends a lot of effort tracking down online articles and surveys that members should see and act upon. GIYUS.ORG and help Israel win the public opinion front. 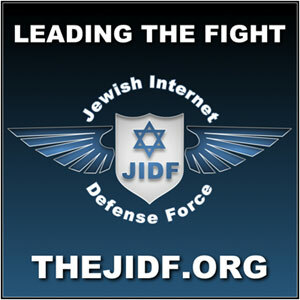 Now let’s look at the other group called JIDF, e.g Jewish Internet Defense Force, sounds very miltary doesn’t it now? We have also been a leading pro-Israel force online, and the success often comes in the form of inspiring someone new, who eventually becomes a solid soldier in our online army. Through the creation of 4 proactive Facebook groups, The JIDF initiated a 35 day campaign urging 5,000 people to report all the following groups. During that time, 106 groups were deleted, Many more groups crop up daily. Jewish Leadership must coordinate with the management of Facebook to help develop plans to fight this problem. Below are links and comments pasted exactly from their VERY long list of youtube users they want suspended, or videos removed. Admittedly some are from skinheads and truly are racist, but the vast majority are just normal videos with excerpts from credible news sources or photos from news sources. Note that the comments under the links are the actual notes this group has made regarding the video in the link it wants removed. Now, this video is a documented media video from a British reporter and an Israeli Human Rights organisation no less. And they want to close this person’s youtube account because they uploaded this video? Why? Because as usual, the video shows human rights abuses by Israelis, so we can’t have that now can we?? Even when it’s an Israeli group that uncovered it and made the documentary, so they attempt to censor their own people!! Oh no, it gets even better, and here’s another one, this is a RAP music video showing news footage and photos of those killed by Israel, again, we can’t let the world see this, they might not like us!! In general, please alert us to any problems of POV-Pushing, bias, subtle antisemitic jabs and the standard “Jew baiting” so commonly found on Wikipedia (WP), so we may update this list and continue cite specific examples. We are also looking to get a lot more active on Wikipedia, since much has been written about the problems and many people have pointed out unfair Wikipedia policies and implementation thereof, especially with regard to Israel and the Jewish people. Just look at this user’s userpage. Wikipedia is supposed to have rules against using it for “soapboxing” but apparently they make an exception in this case (Mary Rizzo’s note: Rance is himself a major gatekeeper and censor… he manipulates according to his own taste pages on Gilad Atzmon, who is a bigger enemy of his than any Zionist is, apparently… but I did not write this post, just leaving my observation in). Heaven forbid, we have to get the word “terrorist” and “HAMAS” in the first sentance, otherwise it’s unfair to poor Israel!! what a load of bollox! As if people can’t think for themselves, we all need Israel to tell us what to think! Don’t think they are serious about closing blogs, webpages, facebook, and youtube accounts and more? They even invented software to use to make their word easier, it is called “megaphone”, and endorsed by the IDF (Israeli army) and government! 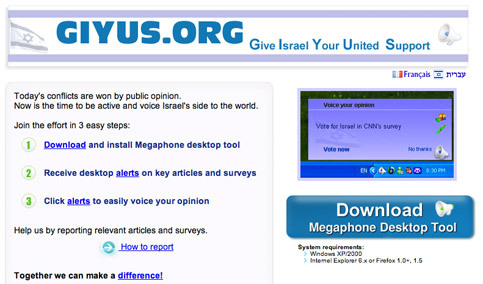 The Megaphone desktop tool is a Windows “action alert” tool developed by Give Israel Your United Support (GIYUS) and distributed by World Union of Jewish Students, World Jewish Congress, The Jewish Agency for Israel, World Zionist Organization, StandWithUs, Hasbara fellowships, HonestReporting, and other pro-Israel public relations, media watchdog, or activism organizations. The tool delivers real-time alerts about key articles, videos, blogs, and surveys related to Israel or the Arab-Israeli conflict, especially those perceived by GIYUS to be highly critical of Israel, so that users can vote or add comments expressing their support of Israel. The tool was released in July during the 2006 Lebanon War. Then come back here and do the same thing with this one. Do this many times a day. Many days a week and share it with all your friends and email lists. The blogs in question are some of the most hateful sites we have seen and clearly against Blogger’s own rules. In the JIDF’s latest efforts, the group has been working around the clock to dismantle the group on Facebook titled, “Israel is not a country! Delist it from Facebook as a country.” That group had tens of thousands of members. Facebook’s negligence and abdication of responsibility gave us no option but to take matters in our own hands,” the JIDF added. The JIDF would not specify what technological methods it used to gain access to the group, but said it succeeded in doing so after the old administrators left. The JIDF received a response from Facebook, he said, which called the anti-Israel group “legitimate political discourse.” Facebook was not available for comment. The JIDF said its efforts are not limited to Facebook, but extend to anti-Semitism and anti-Israel posts found throughout the Internet, including on sites such as Google, Google Earth, YouTube and Wikipedia. So what group or site will they come for next? Beware of who you allow to join your groups and blogs, they will join and then destroy your site. We are all intelligent enough to make up our own minds *if* we are allowed to see unfettered information ourselves, why is Israel so worried? Because the internet is the LAST place news is free and where news can freely be put online for all to see. Don’t’ let Israel gain control of what you see, hear and read. America must stop being Israel’s “poodle”. More information on this subject in tomorrow’s blog, check back then or subscribe to this blog. thus concludes Sinéad’s fine report. A group of Israeli students and would-be cyberwarriors have developed a program that makes it easy for just about anyone to start pounding on pro-Hamas websites. But using this “Patriot” software, to join in the online fight, means handing over control of your computer to the Israeli hacker group. “While you’re running their program, they can do whatever they want with your computer,” Mike La Pilla, manager of malicious code operations at Verisign iDefense, the electronic security firm. The online collective “Help Israel Win” formed in late December, as the current conflict in Gaza erupted. “We couldn’t join the real combat, so we decided to fight Hamas in the cyber arena,” “Liri,” one the group’s organizers, told Danger Room. So they created a simple program, supposedly designed to overload Hamas-friendly sites like qudsnews.net and palestine-info.info. In recent years, such online struggles have become key components in the information warfare that accompanies traditional bomb-and-bullets conflicts. Each side tries to recruit more and more people — and more and more computers — to help in the network assaults. Help Israel Win says that more than 8,000 people have already downloaded and installed its Patriot software. It’s a small part of a larger, increasingly sophisticated propaganda fight between supporters of Israel and Hamas that’s being waged over the airwaves and online. Analysis from iDefense and the SANS Institute, however, reveals that computer users put their PCs at risk when they run the Patriot software. The program connects a computer to one of a number of Internet Relay Chat (IRC) servers. Once the machine is linked up, Help Israel Win can order it to do just about anything. The Patriot program does something “fishy,” SANS Institute security specialist Bojan Zdrnja said, by retrieving “a remote file and sav[ing] it on the local machine as TmpUpdateFile.exe.” That could easily be a “trojan,” Zdrnja said, referring to a program that sneaks malicious code onto a computer. “While at the moment it does not appear to do anything bad (it just connects to the IRC server and sites there — there also appeared to be around 1,000 machines running this when I tested this) the owner can probably do whatever he wants with machines running this,” Zdrnja wrote. It’s also unclear how much the Patriot program is really helping the Israeli side in the online information war. La Pilla has been monitoring Help Israel Win’s IRC servers for days. “They didn’t make us download and install anything. Didn’t make us [attack] anybody. I was basically just sitting idle on their network.” The group claims to have shut down sarayaalquds.org and qudsvoice.net. But, as of now, the rest of the group’s pro-Hamas targets remain online. Meanwhile, Help Israel Win has had to shift from website to website, as they come under attack from unknown assailants.